Making its market debut at NPE 2015 is a polymer alloy technology platform from Teknor Apex Company that can custom-formulate capstocks for rigid profile application in outdoor building products like fences and decking. As said, these capstocks meet the requirements for rigid polyvinyl chloride (PVC) and polyolefins, while providing colors from basic outdoor white to an assortment of very dark colors. Along with the integrated Viking portfolio of products, Teknor Apex now offers compounds that yield a variegated surface, with toners that provide a rich natural undertone and “streakers” that impart a realistic wood-grain effect. 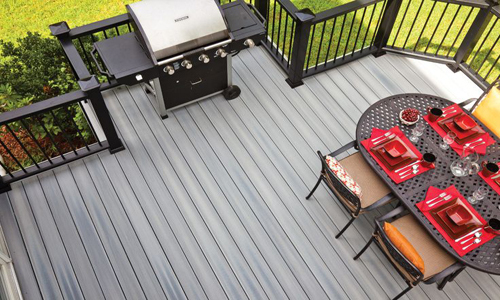 For wood/plastic composite applications such as decking, the company offers a line of polyolefin capstocks. Many of the capstocks available from Teknor Apex are alloys of PVC and other resins with weatherable polymers such as ASA. The company supplies them in pellet form, including pre-colored compounds matched according to requirements. Recommended applications include railing systems, window components, fencing, siding, and decking.